My name is Mr Moneybags. Click here to play! I am a real estate man. I own the greater part of London, including The Strand, Mayfair and Piccadilly. I tell you this not out of boasting, but so that you know that I am serious when I say I am a real estate man. Within three circuits around the Monopoly board, I can take your money and invest it in hotels, railway lines, electricity companies and water plants. I will simply collect a $200 fee every time I pass go, and ask that you do not charge me rent when I stay in the properties I acquire for you. While it is widely known that I have spent many turns in jail, occasionally unable to afford the $50 fine to return to society, I am a reformed man. My dream is to create a property empire for an elite group of investors such as yourself. All the board could be ours. My name is Mr. Moneybags and I am a real estate man. Play the Monopoly slots and watch Mr. Moneybags forge you a fortune from his canny manipulation of the Monopoly property market! The Community Chest symbol is a scatter symbol that awards an instant bonus when 3 or more land in any position on the reels. The award is based on the total bet, not the payline bet, after the player chooses one of the Community Chest symbols. The Mr. Moneybags Wild symbol substitutes for any symbol other than scatter and bonus symbols, and 5 on a payline pay out 12,500 times the line bet. 3 or more Bonus Dice symbols trigger the Pass Go Bonus. In it, players click on a Bonus Dice to reveal the number of rolls they get. 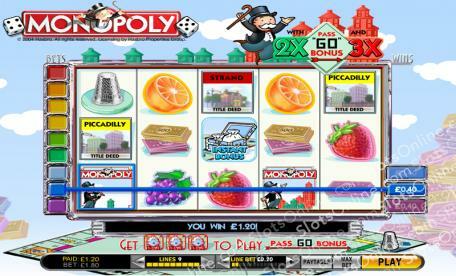 The player's game piece is then moved around a Monopoly board, and prizes are awarded based on where the play piece lands.